Common Methods Used By Burglars To Disable Your Security System | Calgary Alarm Inc.
Calgary has experienced the largest increase in crime across Canada, including break and enters. 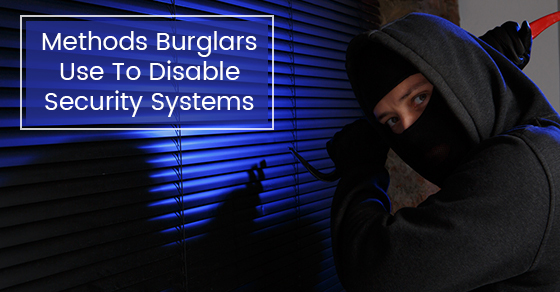 While security systems have been statistically proven to reduce the chance that your home will be targeted by a burglar, there is the potential that these systems can still be disabled, leaving you and your home in a very vulnerable position. However, if you are aware of some of the methods that are commonly used, you can do your best to prevent them from happening and therefore protect yourself. The majority of security systems connect to both the power line and the telephone line. However, burglars simply take wire clippers and cut one or both of these lines, effectively stopping the signal from reaching the authorities. There are several remedies for this. Many newer homes have power boxes and telephone lines that are attached to the foundation of a house, making them hidden from the outside world. Another option is to choose a wireless security system, but it is still possible, although unlikely, to stop the signal. Your best option is to invest in a wireless or cellular home monitoring system, which solves the problem completely by allowing you to make calls regardless of whether your lines were cut. Thieves are increasingly able to hack into home security systems to stop the alarm from going off in the first place or by creating multiple false alarms to make them untrustworthy. They do this by intercepting the signals or by jamming the wifi signal completely. In order to combat this security threat, you can install an anti-jammer that will detect whether or not someone is trying to jam your signal. It is also a good idea to put a password on your wifi and to make your password difficult to guess. Use a series of numbers and symbols and also change this password regularly. If you have displayed information about your alarm company (such as their name) and that you use their services in your home, burglars often have a professional repertoire of knowledge about how these companies wire their devices and therefore know which wire to cut to be able to disable the security system. If you have signs advertising that you have a monitoring system, make them as generic as possible. Consider Calgary Alarms for your choice of monitoring service — we are one of the best security alarm monitoring companies in Canada. We also offer cellular backup monitoring, allowing you to call for help even if your power or telephone lines have been cut. Contact us today for more info.